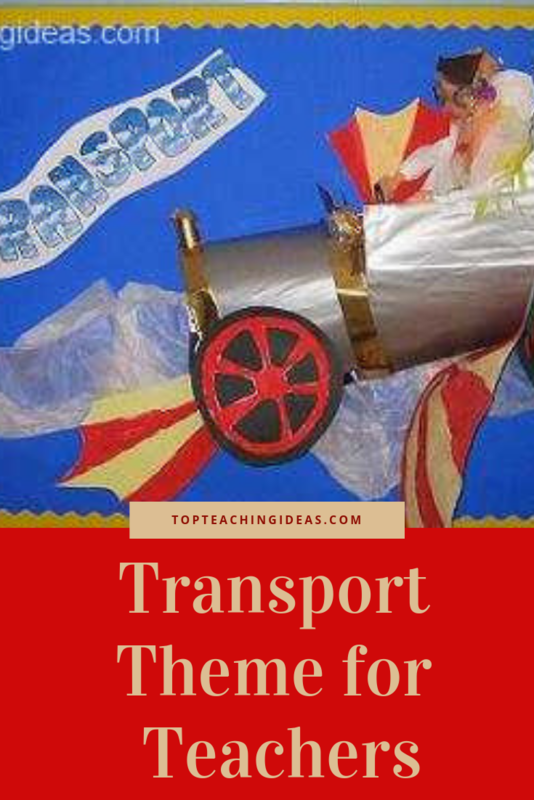 Are you looking for some imaginative transport teaching theme ideas that will inspire the kids in your class? The activities below cover all strands of the curriculum. They include literacy, science, history and transport themed songs to wind down with at the end of the day, as well as much more! These qualities are what we, as educators, aim for in our pupils every day of our teaching career. Sometimes with more difficulty than we imagine! Anyhow please dip into the ideas below and get planning! 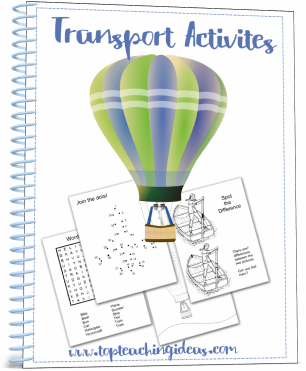 Would you like some worksheets to go with your transport theme? My ebook contains 14 fabulous activities for you to use at home or in your classroom. From coloring sheets to 'dot to dot' and even a wordsearch. 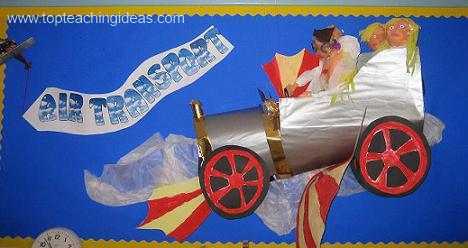 There are several transport teaching theme ideas you can adopt for your dramatic play area. Take a glance at the ideas below! I have found from past experience when you get the kids involved in the building of their play area you find they are more likely to get stuck in! Let them loose in the junk modelling area to make their own microwave or washing machine. Ask them what they think is a' must have' in a Victorian kitchen or what kind of food the astronauts keep in their spaceship. It takes a bit longer but is a great way to get them enthused at the start of a topic. 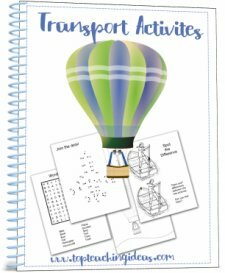 Below are just a few literacy activity ideas to get you started on your transport teaching theme. • Write an advert for a job aboard a submarine, pirate ship or space ship. • Make up some safety rules and procedures. You can download my transport safety rules worksheet here. • Create you own application form for the job you are advertising. • Make a list of clothes you would take with you if you went to the moon for your holiday. • Write a letter to your parents telling them what it is like on the moon or under the sea. • Learn how to read a map and draw one of your own. • Make up some special coded messages . 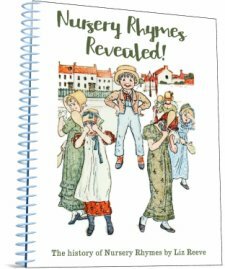 • Write a weather report for the Pirate Ship or the Hot Air Balloon. I have some weather vocabulary ideas that you might find useful. Make luggage Labels or passports for their holidays. Most of these math activities for your transport teaching theme will evolve naturally during the children's play. But some interaction from you might just be needed to get the most out each activity! Make a number plate for their 'box' vehicle. Perhaps they could design a personalised plate with their initials on! Create a car wash for their vehicles and provide a calculator for them to enter a code into. Car sort. Put a selection of toy cars on the table and ask the children to sort them . Allow them to use their own ideas and ask them afterwards what criteria they used..
Measure their junk model vehicles with non standard units . Make a car for a teddy out of junk materials. Help them to decide what size of box they need to chose for their bear to fit comfortably into! Make a vehicle out of 2D or 3D shapes and ask them to tell you what shapes they have used. What happens when you send a toy car down a ramp? Try different sized cars. Measure the distances they travel and discuss results. Do the larger ones go further than the smaller ones? If so why do they think this is?Can they make the car go even faster? If so, how have they done this? Ask the kids how many toy cars they think they can fit into a sock? Let them try. If they put all big cars in their sock, would there be more or less? Allow them to experiment with different sized cars and record the results. This is a list of our favourite classroom songs. All perfect for a transport teaching theme. You will find most of them are on 'u tube'! So if you type in the name of the song and whether you want the music or lyrics or both I can guarantee you will be lucky with the majority of them! The Wheels on the bus . A Sailor went to Sea, Sea, Sea. The Big Ship Sails through the Ally, Ally Oh. Michael Row the Boat ashore. Down upon the Station . Even RE could be introduced into your transport teaching theme. Here are some ideas. • Talk about transport in Jesus' time. • Investigate how people got around in the times of the old Testament. • Design a labyrinth with a theme such as colours of the rainbow or senses. • Make a finger labyrinth. To find out more about labyrinths and how to make them. Check out 'The Labyrinth Society' website. Kids love playing in the water tray so introducing floating and sinking into your transport teaching theme will be easy! Below are just a few ideas to get the kids interested. You might like to take a look at Pre-school Science Activities for some more fun teaching ideas! Children make boats out of junk using different materials ie wood, plastic , paper, polystyrene etc. Test them to see which floats the longest. Can children make a boat that will carry objects? How many do you have to put in the boat before it sinks? Try floating different materials such as foil, pieces of material, cotton wool , feathers , sponges, grease proof paper, paper and paper towel. Record which materials stay afloat the longest. What changes do you notice and what happens when you push the floaters to the bottom of the tray? Write down your observations. Put floaters in different strengths of salt solutions . What do you notice? Try floating ice cubes. Observe what happens. Investigate how you can make a sinker float. Investigate displacement. Put different size objects in a jar full of water. What do you notice? Record results. Science related tasks are always a great way to get kids involved in a topic. Pushes and pulls can sound rather dull but if you chose the right activities it can be a great way of encouraging the kids to solve problems. An important part of the learning process. 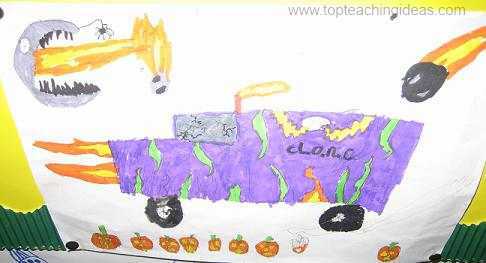 So take your pick from some of the transport teaching theme ideas below and watch how the kids get fired up! • Getting dressed and undressed. Get the children to notice what kind of force they use to take their jumper off.Then do the same putting it on again. Is it a push or a pull or both? Get them to do it again slowly and shout out 'push' or 'pull' as they proceed through the task! • Moving about in the hall. The children investigate moving slowly and moving quickly, stopping and changing direction. • Move a heavy box. How is it easier to move? To push or pull it? Let the kids have a go You could discuss the Egyptians and the problems they must have had moving those giant stones when they made the pyramids. What do we use today? • Mime opening a door or pulling a cracker or riding a bike. What force is used? • Children can investigate all the above with different weighted cars. • Try sending cars down a ramp. Which car goes the furthest/fastest? How can we make a fair test? Allow time for their predictions. • Allow the kids to report back to the class and explain their results. • Discuss dangers of moving objects In the park or on the road or even in the playground. Why would it be dangerous to try and stop a moving object? Design , draw and label a car from the future. What futuristic gadgets could it have inside and out? • Design a Grand Prix race track using parallel lines . • Design and draw your own racing car. Make 3d road signs. Draw large road signs on card. Cut each one out and paint it in appropriate colours. Draw a road layout in the outside play area and use your road signs here. Make a car out of a cardboard box for your road. Paint it with acrylic paint, [don't forget the number plate!] then cut out the bottom so they can grab the sides and tear round the play road to their hearts content! Be careful to stop at the traffic lights though! Make a pirate ship or a space craft out of cardboard boxes. I never mention the word 'history' when introducing the following tasks to the kids because it puts them off straight away. I usually start this part of the topic with a story. 'Mr Gumpy's Outing' is a good choice. 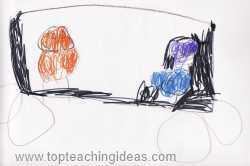 Then during circle time having read the story through once, I talk to the children about how Mr Gumpy's car is different from cars they see today. I try and have some pictures of old cars as well as new ones so we can discuss the differences and similarities. Also we try and make a collection of old and new toy cars for the classroom. Below are just a few activities you can do to bring history into your transport teaching theme. Investigate old cars. How are they different from modern ones? Find out about the first aeroplanes . Who was the first person to fly in one? Who invented the first train? Look at pictures of the penny-farthing . Why do you think we don't ride them today? All of the books below can be found on Amazon. If you should want to buy any of them, just click on the title. They all fit into the Transport Theme well and the kids love a good story! So do try and use one at least in your topic. I hope you have found some of these ideas useful and if so please check out some more ideas on my site. 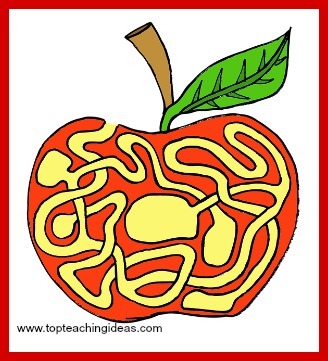 Need inspiring teaching ideas? You have come to the right place.